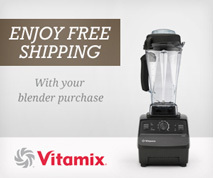 A Vitamix will make creamy salad dressing from nuts, and you can easily customize the flavor. We ate this dressing on a massaged kale salad, but it’s also good on a simple lettuce salad. The dressing is mild and creamy, slightly sweet with a hint of tartness, and has a light kick from thyme. Place ingredients in blender, start on low and ramp up to max speed. If any bits of nuts get stuck to the upper walls of the container, you can stop the blender and scrape down the sides with a spatula, then run it a bit longer. Total blending time ~40 seconds. 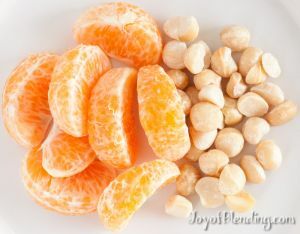 You could also use an orange or orange juice in place of the tangerine, and other herbs or even garlic instead of thyme. 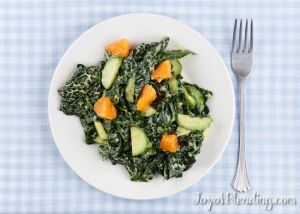 For a massaged kale salad, wash the kale, de-spine it, cut it into strips, then knead it with a pinch of course salt and a bit of olive oil for a few minutes, until it becomes noticeably softer and more tender (it shrinks and appears greener as well). The salad pictured above also had two sliced Persian cucumbers. Tasty!